One of the best things about organizing a destination wedding in Veneto is that both the spouses and their guests can enjoy a holiday in a new and fascinating setting. In the days before or after the wedding in fact you can organize sightseeing in major cities such as Venice, Padua and Verona or relaxing days at the spa of Abano and Montegrotto or even hiking in the Euganean Hills, not very known and truly unforgettable places. Your Wedding in Villa is at your side in all the moments of your special day’s organization and can also help you with all the activities you could do with your loved ones! Here you will find our related articles precisely to the destinations that you could visit. As for the Euganean Hills we can rely on the experience of Viaggiare Curiosi, the Paduan start-up that takes you on foot, by bike and by rowing boat to discover the heart of Veneto. The new incoming tour operator VIAGGIARE CURIOSI was born from the experience of Carmen Gurinov, Italian-Romanian tourist geographer and guide, who will make you discover completely the territory of the Thermal Baths and the Euganean Hills, just outside Padua and Venice. Not only mud and thermal water, but also outdoor activities on foot, by bike and rowing boat, cultural visits to castles and food and wine experiences to discover hidden aspects of local culture. 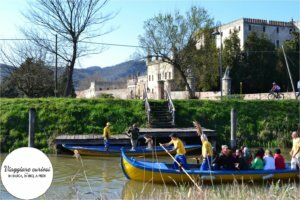 Among the tourist experiences proposed (ranging from half a day to a week’s holiday), the rowing boat trips follow the medieval canals that embrace the Euganean Hills Regional Park and the chat with the boatmen leads to discover fascinating stories. The tours are carried out in caorlina, the traditional Venetian wooden boat run by professional rowers. The added value of the slow itineraries of VIAGGIARE CURIOSI, in fact, lies in knowing the inhabitants of the places and their stories. The walking tours, on the other hand, lead you to discover country paths, the warm welcome of the cellars and their fine wines produced from the volcanic soils of the Euganean Hills. During the tasting of the Serprino, the local Prosecco, and of the Fior d’arancio, the Moscato DOCG of the Euganean Hills, it will be possible to meet Nicola, a young winemaker who has recently produced his first wine. The bike tours run along the Wine Route, the green ways of our territory, the romantic meanders of the canals or the cycle ring that completely surrounds the hilly area to meet the Venetian villas, the Baroque gardens and the Benedictine abbeys that dot the territory. Available for travelers, a minibus for 8 people, rental bikes, as well as the possibility to book restaurants, overnight stays and transfers for a carefree holiday in the green heart of Veneto. Do not hesitate to contact us to start studying together the ideal solution for you and your guests!